Recently I got invited to run in a relay I'd been hoping to get in to, it was a new event, free, and quite popular, so it filled up quickly. Lucky for me someone dropped out at the last minute and I got to take their spot! Yay! Norah's preschool went to the Children's Museum on a field trip the other day. She was super excited. I love going to these things with her (and Ava when we used to do this stuff). They had a circus theme, it was great! I really do love volunteering and I'm so glad I can do it, but I have to say, I find it sort of *funny* how it works out financially. First, you are giving up your day to be there, next they charge you for your kid to go, and then they charge YOU to go, and then you have to pay to park...so yes, I'm glad I can be there but it sort of feels like you should get all that free, in trade for your time. 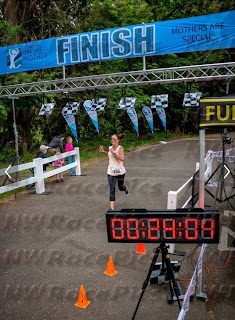 Mother's day started out in my very favorite way, a race! The only unfortunate part was that I had to get up at 5 am to volunteer at the race before it started, it was with a bunch of friends though, so it was still fun and totally worth it! 24:00 PR by 16 seconds. It was the Run Like a Mother race and my running group organized the whole thing, pretty awesome! Here I am with Melanie, last time we raced together was Vernonia, so it was super fun to run with her again. Also her family has a cool tradition of doing this race together, she had about 15 or more of her people in the race too! Love it! Andie was there, she got pushed by two of my friends, and sang the National Anthem before the race started too! We are working on a virtual race to raise money for a new racing chair for her soon. Courtney & Heather, we represent half of our 12 bridges relay team, that's later this month.